Tumor (American English) or tumour (British English), Latin for swelling, one of the cardinal signs of inflammation, originally meant any form of swelling, neoplastic or not. Current English, however, both medical and non-medical, uses tumor as a synonym for a neoplasm (a solid or fluid-filled cystic lesion that may or may not be formed by an abnormal growth of neoplastic cells) that appears enlarged in size. 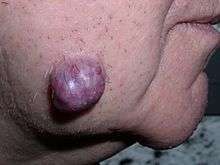 Some neoplasms do not form a tumor; these include leukemia and most forms of carcinoma in situ. Tumor is also not synonymous with cancer. While cancer is by definition malignant, a tumor can be benign, precancerous, or malignant. The terms mass and nodule are often used synonymously with tumor. Generally speaking, however, the term tumor is used generically, without reference to the physical size of the lesion. More specifically, the term mass is often used when the lesion has a maximal diameter of at least 20 millimeters (mm) in greatest direction, while the term nodule is usually used when the size of the lesion is less than 20 mm in its greatest dimension (25.4 mm = 1 inch). Individuals with a germ line mutation causing deficiency in any of 34 DNA repair genes (see article DNA repair-deficiency disorder) are at increased risk of cancer. Some germ line mutations in DNA repair genes cause up to 100% lifetime chance of cancer (e.g., p53 mutations). These germ line mutations are indicated in a box at the left of the figure with an arrow indicating their contribution to DNA repair deficiency. In further examples, epigenetic defects were found at frequencies of between 13%-100% for the DNA repair genes BRCA1, WRN, FANCB, FANCF, MGMT, MLH1, MSH2, MSH4, ERCC1, XPF, NEIL1 and ATM. These epigenetic defects occurred in various cancers (e.g. breast, ovarian, colorectal and head and neck). Two or three deficiencies in expression of ERCC1, XPF and/or PMS2 occur simultaneously in the majority of the 49 colon cancers evaluated by Facista et al. 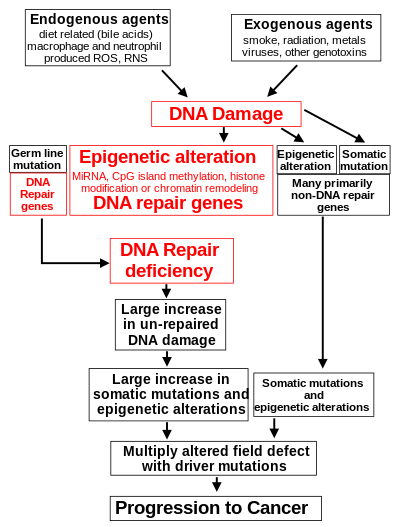 Epigenetic alterations causing reduced expression of DNA repair genes is shown in a central box at the third level from the top of the figure in this section, and the consequent DNA repair deficiency is shown at the fourth level. ↑ Taylor, Elizabeth J. (2000). Dorland's Illustrated medical dictionary. (29th ed.). Philadelphia: Saunders. p. 1184. ISBN 0721662544. ↑ Stedman's medical dictionary (28th ed.). Philadelphia: Lippincott Williams & Wilkins. 2006. p. Neoplasm. ISBN 0781733901. ↑ "II Neoplasms". World Health Organization. Retrieved 19 June 2014. 1 2 Abrams, Gerald. "Neoplasia I". Retrieved 23 January 2012. ↑ "Cancer - Activity 1 - Glossary, page 4 of 5". Retrieved 2008-01-08. ↑ "Pancreas Cancer: Glossary of Terms". Retrieved 2008-01-08. ↑ Mokarram P, Zamani M, Kavousipour S, Naghibalhossaini F, Irajie C, Moradi Sarabi M, Hosseini SV (May 2013). "Different patterns of DNA methylation of the two distinct O6-methylguanine-DNA methyltransferase (O6-MGMT) promoter regions in colorectal cancer". Mol. Biol. Rep. 40 (5): 3851–7. doi:10.1007/s11033-012-2465-3. PMID 23271133. ↑ Truninger K, Menigatti M, Luz J, Russell A, Haider R, Gebbers JO, Bannwart F, Yurtsever H, Neuweiler J, Riehle HM, Cattaruzza MS, Heinimann K, Schär P, Jiricny J, Marra G (May 2005). "Immunohistochemical analysis reveals high frequency of PMS2 defects in colorectal cancer". Gastroenterology. 128 (5): 1160–71. doi:10.1053/j.gastro.2005.01.056. PMID 15887099. ↑ Valeri N, Gasparini P, Fabbri M, Braconi C, Veronese A, Lovat F, Adair B, Vannini I, Fanini F, Bottoni A, Costinean S, Sandhu SK, Nuovo GJ, Alder H, Gafa R, Calore F, Ferracin M, Lanza G, Volinia S, Negrini M, McIlhatton MA, Amadori D, Fishel R, Croce CM (April 2010). "Modulation of mismatch repair and genomic stability by miR-155". Proc. Natl. Acad. Sci. U.S.A. 107 (15): 6982–7. doi:10.1073/pnas.1002472107. PMC 2872463 . PMID 20351277. 1 2 3 4 5 Facista A, Nguyen H, Lewis C, Prasad AR, Ramsey L, Zaitlin B, Nfonsam V, Krouse RS, Bernstein H, Payne CM, Stern S, Oatman N, Banerjee B, Bernstein C (2012). "Deficient expression of DNA repair enzymes in early progression to sporadic colon cancer". Genome Integr. 3 (1): 3. doi:10.1186/2041-9414-3-3. PMC 3351028 . PMID 22494821. ↑ Gerlinger M, Rowan AJ, Horswell S, Larkin J, Endesfelder D, Gronroos E, Martinez P, Matthews N, Stewart A, Tarpey P, Varela I, Phillimore B, Begum S, McDonald NQ, Butler A, Jones D, Raine K, Latimer C, Santos CR, Nohadani M, Eklund AC, Spencer-Dene B, Clark G, Pickering L, Stamp G, Gore M, Szallasi Z, Downward J, Futreal PA, Swanton C (March 2012). "Intratumor heterogeneity and branched evolution revealed by multiregion sequencing". N. Engl. J. Med. 366 (10): 883–92. doi:10.1056/NEJMoa1113205. PMID 22397650. ↑ Lochhead P, Chan AT, Nishihara R, Fuchs CS, Beck AH, Giovannucci E, Ogino S (2014). "Etiologic field effect: reappraisal of the field effect concept in cancer predisposition and progression". Mod Pathol. 28: 14–29. doi:10.1038/modpathol.2014.81. PMID 24925058. ↑ Svrcek M, Buhard O, Colas C, Coulet F, Dumont S, Massaoudi I, Lamri A, Hamelin R, Cosnes J, Oliveira C, Seruca R, Gaub MP, Legrain M, Collura A, Lascols O, Tiret E, Fléjou JF, Duval A (November 2010). "Methylation tolerance due to an O6-methylguanine DNA methyltransferase (MGMT) field defect in the colonic mucosa: an initiating step in the development of mismatch repair-deficient colorectal cancers". Gut. 59 (11): 1516–26. doi:10.1136/gut.2009.194787. PMID 20947886. ↑ Berger MF, Hodis E, Heffernan TP, Deribe YL, Lawrence MS, Protopopov A, Ivanova E, Watson IR, Nickerson E, Ghosh P, Zhang H, Zeid R, Ren X, Cibulskis K, Sivachenko AY, Wagle N, Sucker A, Sougnez C, Onofrio R, Ambrogio L, Auclair D, Fennell T, Carter SL, Drier Y, Stojanov P, Singer MA, Voet D, Jing R, Saksena G, Barretina J, Ramos AH, Pugh TJ, Stransky N, Parkin M, Winckler W, Mahan S, Ardlie K, Baldwin J, Wargo J, Schadendorf D, Meyerson M, Gabriel SB, Golub TR, Wagner SN, Lander ES, Getz G, Chin L, Garraway LA (May 2012). "Melanoma genome sequencing reveals frequent PREX2 mutations". Nature. 485 (7399): 502–6. doi:10.1038/nature11071. PMC 3367798 . PMID 22622578.